Fillmore and Western Railway offers two different train ride experiences with Santa - either to visit his polar workshop, or to ride the Sugar Plum Express to a holiday village. 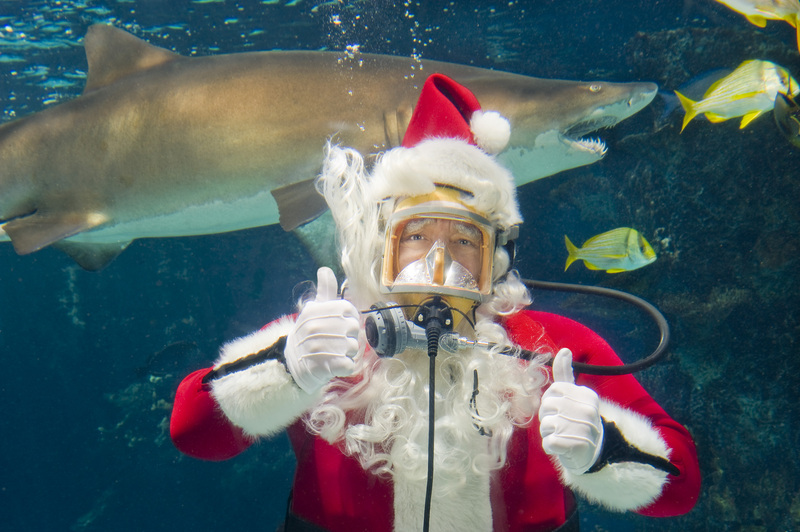 Santa dives in among the underwater critters at the Aquarium of the Pacific to bring them some Christmas treats, and guests can pose for photos from the dry side of the glass. Mountain High's annual Santa Sunday offers two equally great options: come to the resort dressed as Santa Claus and get a free lift ticket (with a $20 donation to a climate change advocacy group) or just come to the resort to ski with 100 or so Santas all day. Either way, it's a great photo op, with the bonus of a great day on the slopes. This is a pretty traditional Santa Claus, and the visit is not remotely free, but what could be more SoCal than hanging with the happiest dude on earth at the happiest place on earth? The King of Christmas can be found at the Redwood Creek Challenge Trail in California Adventure, where his elves have some outdoor games set up, and he takes photos with fans, through Christmas Eve. If your preference is for something more uniquely Disney, Santa Goofy is at Ahwahnee Camp Circle posing for photos and signing autographs from December 25, 2018-January 6, 2019. You can find more holiday activities in our Holiday Fun Guide; and subscribing to our weekly newsletter will help make sure you don't miss a thing!